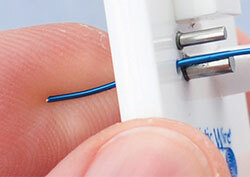 Insert a piece of wire (20-24 gauge) 5'' (12.7cm) in length through the hole in the findings form and bend the end (this helps to hold the wire firmly as you bend the wire around the pegs). 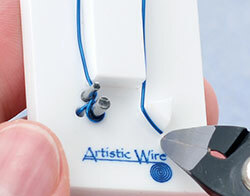 Wrap the wire around the large peg (clockwise) then slightly around the thin peg and up (clockwise) around the acrylic form. 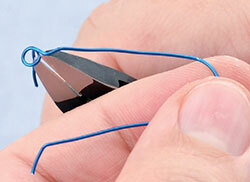 Wrap the wire over and down the acrylic form then down the side of the triangle acrylic form then out to the right. 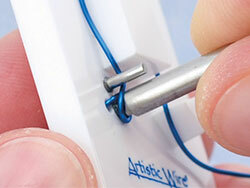 Use the pusher tool on the small peg to tighten the intersection of the wire. 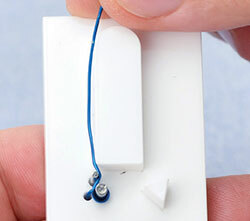 Cut the end of the wire as shown (it's advised to use a wire rounder on the end of the earwire to smooth out the sharp edges left by the flush-cutter). 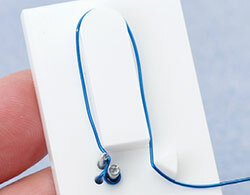 Remove the earwire and cut the ring so that it forms a complete circle.